Solar Flower | Night Cleaner | Yukons | Rated Age | Blammo | Rug | + Free After-Party w/ DJ Mannequin Lover! "When people talk about the beginnings of the music scene in Athens, GA the discussion usually begins “The B-52’s, R.E.M., ….” Those who know will continue the list, “Pylon.” They were every Athens band’s favorite Athens band. Their musical naïveté, southern upbringing, art school smarts, and house-party roots exploded together to create something quite improbably amazing, hitting the listener on mental, physical, and spiritual levels simultaneously. On the surface, their angular guitar parts and propulsive rhythm section had something in common with UK post-punk bands like Gang of Four and PiL. But Pylon was more fun and less studied. And they had a secret weapon in Vanessa Briscoe Hay, whose inimitable vocal textures and phrasing defined the band’s sound for most listeners. Pylon’s celebrated history came to a sudden end with the death of iconic guitarist Randy Bewley in 2009. Pylon was and always will be Vanessa, Randy, Michael, and Curtis. It is a certainty that the band will not reform with a new guitarist. But hey, kids. Everything is still cool! 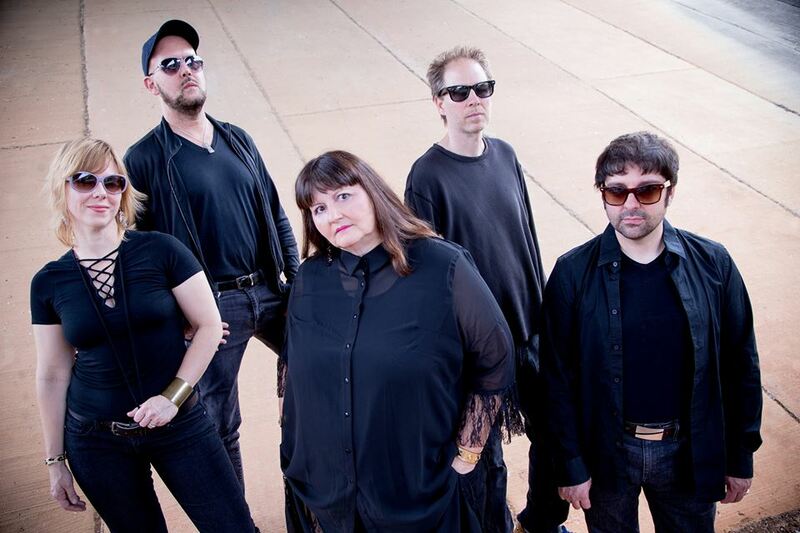 Vanessa has gathered members of Athens bands Casper & the Cookies, The Glands, and world renowned pianist Damon Denton to create Pylon Reenactment Society. Is it a cover band if Vanessa is singing? Technically, it’s the next best thing. PRS are here to have fun and perform in the spirit of Pylon. Don’t be discouraged! Let’s dance!" PC Worship's new LP Buried Wish is an off-kilter journey through hook-laden alternative rock, experimental tape manipulation, downer punk riffs and long form improv-based psychedelic instrumentals. 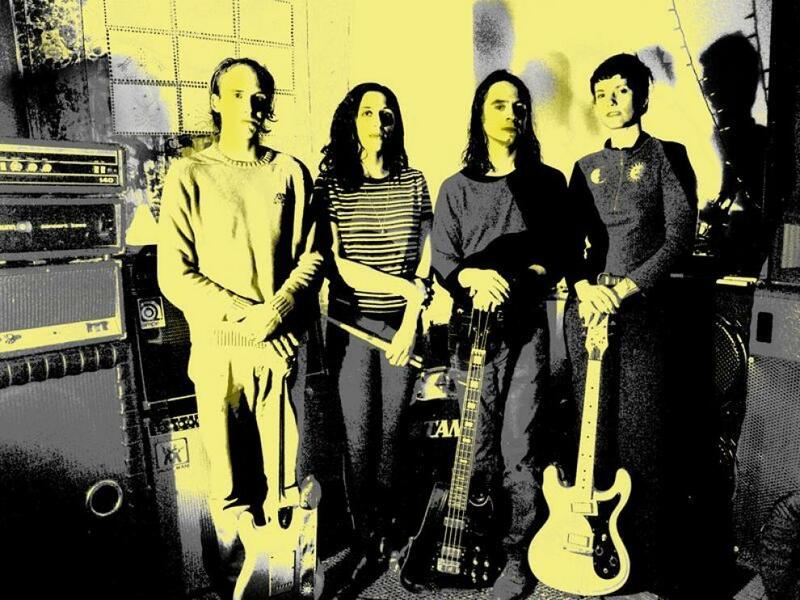 As the album weaves through the damaged re appropriation of objectionable sounds, it seeks to explore a contrast between the traditional rock band format + instrumentation with outsider experimentalism by exploring new ideas related to composition and unconventional (often homemade) instrumentation. Buried Wish further embodies PC Worship's dedication to categorical ambiguity as it opens with a prelude written for a horn quartet + tape loops and ends with a pseudo-americana, sludge folk song, while throughout the album, continues the familiar PC aesthetic of unfiltered, subconscious inspiration, fueled by dystopian lyrics, eternal guitar solos and vamped out sonic exploration. Buried Wish was written and recorded by Justin Frye in the basement of a condemned building throughout 2016 in Bushwick, which flooded half way through the process. It was sourced from drawn out solo tracking, upright bass experiments, large ensemble improv sessions and random input from various collaborators over the past year, with contributions from Michael Etten, Jessica Papitto, Shannon Sigley, Mario Maggio, Jordan Bernstein, Pat Spadine, Greg Fox, Marilu Donovan, Kassie Carlson and Adam "Junkyard" Markiewicz, among others. "The contemplative riffing of Solar Flower’s debut LP illuminates the kaleidoscopic possibilities of heavy music while reframing a love of psychedelia within an authentic context. Despite the ripping guitars, these songs aren’t prosaic rock and roll tales, but neither are they fantastical myths that eschew reality for sci-fi epics or wandering wizards. Instead, Solar Flower pull from the simple wonder of existence to write songs brimming with the essence of life. Somehow it’s been 10 years since Ty Segall released his first LP, and though the sonic comparisons are apt, to simply file away You Are on a shelf with a slew of heavy psych records would be to miss the point. Solar Flower’s inspiration is less a fetishization of a musical era, and more of a kindredship with the spiritual ideals of the ‘60s. The album is more about community than cavorting, and even though there’s an obvious appreciation for hippie ambitions, the band’s interpretation of them is richer, integrating a love of nature with Eastern philosophy and never reducing any encounters with awakening to simple catchphrases. 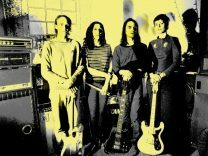 While the group began as an excuse for Dorothy Stucki, Sidrah Mahmood, and Rob Sarabia (Dasher, Mutual Jerk) to jam in the hallway of a storage unit, when they added Bo Orr (Arbor Labor Union) to flesh out guitar textures, Solar Flower took on the form found on You Are. Although Orr and Sarabia were more musically experienced than Stucki and Mahmood, it was important to the band that the songwriting was a collaborative, learning experience in which each member contributed equally. Nowhere is this unity of purpose more discernible than on the record’s vocal mix. Instead of relying on any form of lead vocals, the four voices combine to form a single organism which crescendos and decays with an angelic drone. Beyond confirming the importance of nature and spirituality to humanity’s existence, the band didn’t elaborate much when I inquired about the intersection between the topics and themes found on the record. The open-ended nature of the group’s response mirrors the magic of the album—ritual without dogma, an interpretive journey which allows the listener to overlay the band’s wisdom over their own spiritual experiences. Each track exhibits this freedom in a unique manner, but perhaps the best example is the album’s closer, “Forms,” which reframes the religious language of rebirth and changing form in the context of a musical experience, specifically dancing. Though the track opens with a fuzzed-out thrown down, it soon coagulates into a harmonic chant which allows for pensive retreat into the listener’s own mind even as our bodies are drawn into the song’s communal rhythm. Since post-punk morphed from an offshoot of new wave into something less bound by generation but more nebulous as a whole, artists have been utilizing the colder elements of the genre to expose the emptiness of consumerism and to push back against the bankrupt neon hues of success and progress. On the second EP from Night Cleaner, All the Saints guitarist and vocalist Matthew Lambert focuses these social queries into an analysis of sound and self. The name conjures visions of fluorescent hallways and patterned carpets in deserted office parks, but the isolation and introspective longing of Even lend themselves to his focused meditation. Though these six tracks channel the same anti-commercial desperation of ‘80s post-punk, Lambert digs further into the psyche of the individual, and as a result, Even reflects the endless motility of mind and body. Lambert’s first foray as a solo artist came in the form of a more ambient project. 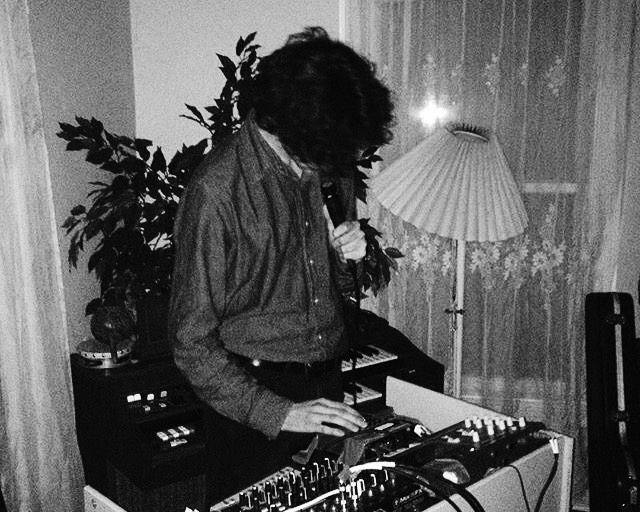 His debut release, 2015’s A Sketch for Winter III: Greensleeves, was an emotionally resonant dreamscape, which, though hazy and narcotic, was also pastoral and intimate—a bucolic scene from another planet. Even is no less delicate, but here the textures take sharper forms. 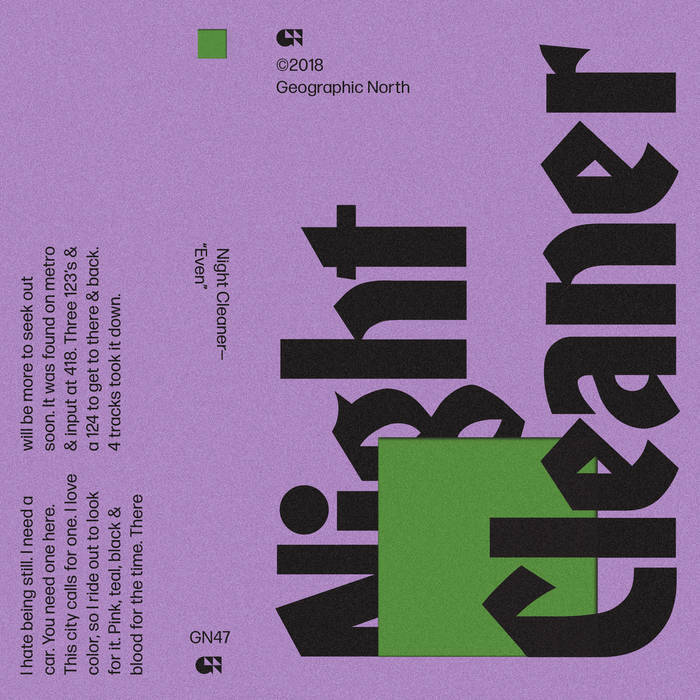 The urgency of the EP is new to Night Cleaner and nowhere is it more evident than on “Solids (No Tint).” The track rides a simple, grinding synth line to an unknown destination, but the insistence of the beat is confrontational and gripping. This immediacy is also evident in the less robotic bits of the EP. Indeed, the carnal thrum of “WDE” reflects the sensory experience that is key to the album: Throughout Even, what is known must be encountered personally. Much as All the Saints are shoegaze by way of expression rather than intention, the diverse sounds of Night Cleaner are driven by process rather than objective. Geographic North releases are always extremely focused in scope if not sound, and Even is no different. Yet within this collection of densely curated post-punk, there’s a sprawling universe of individual palettes and tones. Lambert drew inspiration from a wide variety of sources, from DJ Screw to Depeche Mode. “On the surface, it definitely seems disparate, but to me it makes all kinds of sense,” he explains over email. “I just draw inspiration from the analog glaze and continuous pulsing flow of Screw tapes. Once I started writing more with the MPC and synths, I became even more drawn to groups like Solid Space, Depeche Mode, and especially Seventeen Seconds by the Cure. I love the way these guys balanced icy keys/synths, simple drum machine beats, and mix them with the melodic, psych-tinged guitar.” Though he makes the comparisons seem obvious, and the implementation effortless, the frigid textures of the EP are balanced by a sense of wonder which buoys the synth lines and prevents the harsher elements from dragging the record into the depths of self-conscious claustrophobia. Lambert wrote most of Even in the seclusion of a home studio late in the evening, but just as critical to the writing process were a series of drives he took around East Point, College Park, and Decatur. Driving as a theme or even as part of the writing process isn’t novel to songwriting, but the device works especially well in the car-centric world of metro Atlanta. For Lambert, the insular environment of city streets at night is a palette for sounds and ideas to take shape internally. “As I’ve gotten older, I started finding beauty in the sprawling nature of this city,” he says. “Motion is a key element of creation for me. So often I take these demos and just drive and fine tune them in my head until I can get back to my setup and bang them out.” This focus on motion as a catalyst for creation permeates the entire record without seeming contrived, especially on “Privacy Light.” The woozy, slow-burning track transmits the decaying romance of the Jesus and Mary Chain in its pulsing beat before whining into the distance. Throughout Even Lambert indulges his own creativity while deftly paying homage to his idols. In doing so, he has made a record which constantly changes its form. Though it is expansive as a whole, each track is narrowly focused. As a result, the sources of light and intimacy on Even may be distant, but the EP’s untethered exploration makes them feel reachable and therefore even more consequential. Even is available now on limited-edition cassette and digital. 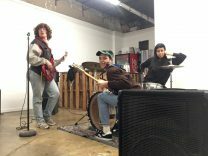 "Comprised of Danielle Dollar on drums, Hannah Lenkey on bass, and José Joaquín Izaguirre on guitar and vocals, Yukons have been lurking in the shadows of the Atlanta DIY scene, cutting their teeth, like so many bands before them, on a steady diet of supporting gigs and house show performances. 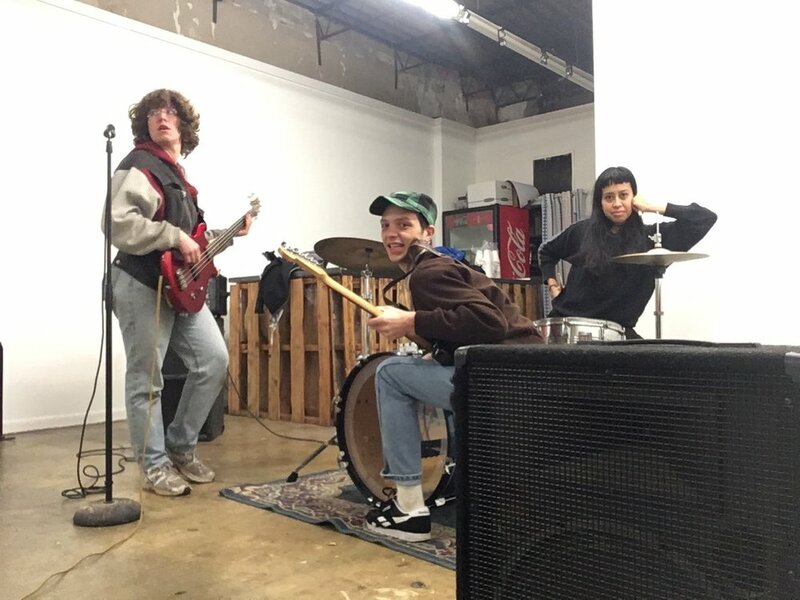 Their 2016 debut cassette, Ice cream / Death, revealed a group capable of corralling various elements of ‘90s college rock, punk, emo, and shoegaze, and shaping them into taut, emotive songs full of cathartic hooks and a kind of ominous energy. Even their most pop-friendly tracks couldn’t keep an aura of darkness and angst from bleeding through, which is just fine with the Latinx, predominantly female and queer trio, who have taken to calling their sound Latinx Expression rock. “I live in a country that’s disgraced Latinx people,” says Izaguirre. “As a Latinx individual, I feel it’s important to create and speak up right now. People give dirty looks when they hear my Spanish in public now. Half the songs on the summer album will be in Spanish. 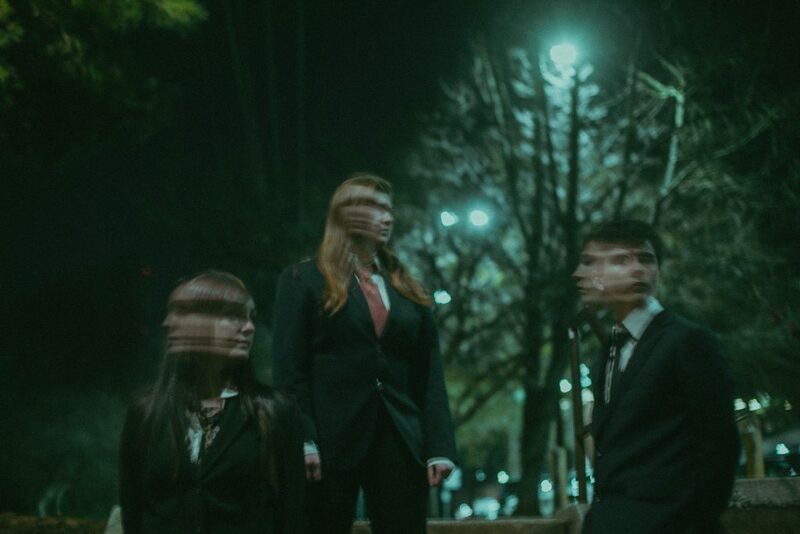 That’s what Latinx Expression means.” With “Clockwerk,” the lead single from the band’s upcoming first full length, Yukons are looking to step out from the shadows and into the light. Like most of their tracks, it toys with traditional classic rock tropes—guitar-heavy song structures; the brooding, mysterious frontman—before subverting them with a series of off-kilter rhythms and compositional left turns. Listen close and you’ll start to make out the origins of the trio’s compelling template—a bit of Pixies’ manic accessibility, a dab of Slint’s corrosive crunch, a touch of Sleater-Kinney’s jagged urgency. 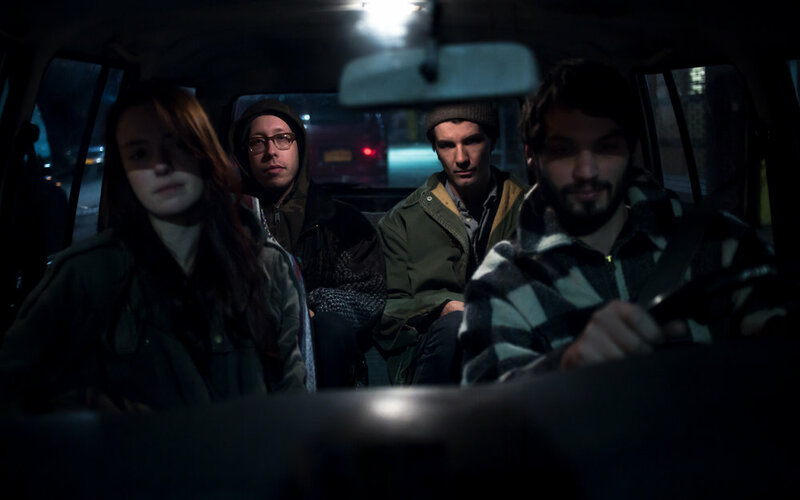 It’s not a new sound by a long shot, but the band plays with eager confidence and an underlying sense of deep anxiety tempered by clear-eyed cool. Life on the margins can be hostile and dangerous, but “Clockwerk” shows it can be plenty powerful, too." + Free After-Party w/ DJ Mannequin Lover!